Butter used to be a project that took our foremothers all day. 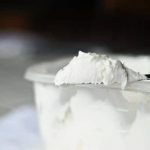 How wonderful it is that we can now whip up a batch of homemade sweet cream butter without much fuss or trouble and can even do other kitchen tasks while the homemade butter practically makes itself! Then it breaks and falls before it looks curdled. You’ll begin to notice a milky liquid puddling along the sides. This is when I like to switch to the paddle attachment. I like to start with the whisk attachment and then switch to the paddle in the end. I’ve done lots of experimenting with both attachments and with various speeds and have found that when you start with the whisk it makes smaller butter pieces, extracting the most buttermilk which makes for less rinsing later, and then the paddle attachment brings all those bitty buttery pieces together in a beautiful golden lump. Keep your butter fresh and soft with a butter bell! Butter muslin has a finer weave than regular cheesecloth. This silicone pan makes the perfect 1/2 cup butter sticks. 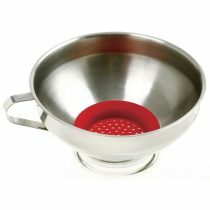 I love this tool- it’s a funnel fit with a silicone strainer. When it’s all clumped together in a ball of butter and the buttermilk is beginning to splash up the sides of the bowl, you’re just about done! Quickly shut off the mixer before you make a mess. Just be careful that when you turn off the mixer you don’t accidentally turn it UP! It will splash everywhere!! Drain the buttermilk off into a bowl- BUT DON’T THROW IT AWAY! 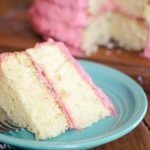 You can use it anywhere you use buttermilk. 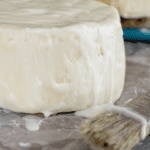 Or you may put in a tablespoon of cultured buttermilk and leave it out in a warm place to culture until thick and then you have a beautifully thick, cultured buttermilk. It’s so simple! Once the buttermilk is drained, put the butter back into the mixer bowl and run some really cold water over the butter and massage out any residual buttermilk. Drain the milky water and refill it with more cold water and repeat the massaging and rinsing and draining until the water is clear. And you’re all done! Unless you’d like salted butter. So I’ll massage in ¼ teaspoon of butter for every 2-3 cups of cream I used to make the butter. It depends on how your taste preferences. I don’t worry about having salted vs. unsalted butter on hand for baking. I’ve yet to notice a difference in a recipe where it called for unsalted butter and I used salted instead. It’s just one less thing I have to manage. At this point you have to decide whether or not to take your butter to the next level and make an herbal compound butter or bacon butter. Which I can’t begin to recommend enough. You’ll never go back! Sit the cream out on the counter to warm up for an hour or two. Slightly warmed cream (50-60 degrees) whips up into butter more quickly. When the cream begins to separate into small chunks of butter and you can see the buttermilk beginning to gather at the sides, switch to the paddle attachment. Place the butter back into the mixing bowl and cover the butter with cold water. Massage the butter, releasing any remaining buttermilk. Drain the cloudy water, refill, massaging again until all the buttermilk is released and the rinse water stays clear. Massage in ½ tsp., more or less, to taste. or spread into a silicone pan (I use this one. )to make a stick. Hey there Quinn! Thanks for this great info. I'm confused about one part…when you say "massage" the butter, are you talking about using the stand mixer again, or with your hands, or a spoon, or what exactly? I'm new to this. Any tips appreciated! Thanks! 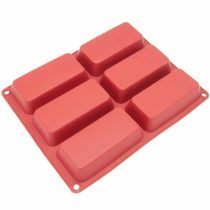 i just recently started making my own butter, and while researching, i found butter paddles. i ordered them the other day, and should be receiving them soon. they are sort of like a little wooden cutting board, only they have little ‘grooves’ in them. you ‘massage’ the butter with them, and the buttermilk comes out through the grooves. i think they should work really well!! 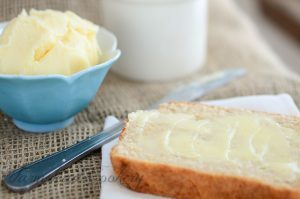 i can’t believe how easy it is to make yummy butter!!! i’m hooked!!! Yes! I got butter paddles last fall and they’re pretty slick little tools! Plus I feel super cool going back to my pioneer roots using them-lol! Have fun with yours! I lived on the farm when I was 16 years old. I learned how to milk the cow, separate the milk and make our own buttermilk. (Grandma had a (“Wealth of Knowledge”). Then we made our cream and of course we churned our butter. She was in her late 80’s so we used an electric jar. It was quite big because she sold her butter, buttermilk and eggs at least twice a week. I tried to find a picture of the butter churn, I well keep looking for it. If I find it I will forward it to you. Your Blog is GREAT! I am new to it, but you will be hearing from me again. Just curious… would this work with heavy whipping cream from a store?